PLEASE TAKE NOTE: THE INSTRUCTIONS GIVEN BY CAR NAVIGATION SYSTEMS (GPS) MAY NOT BE THE MOST ACCURATE AND MAY TAKE YOU ON A LONGER AND LESS COMFORTABLE TRIP. PLEASE CONSIDER THE INSTRUCTIONS BELOW. When coming from the airport, take the VR1 expressway, towards Ribeira Brava. After passing through Funchal, at km 10,4, take the exit n.º 5, entering the VR2 expressway towards the Estreito de Câmara de Lobos (after 1,5 km, ignore the exit to Jardim da Serra, on the right – it finishes before, near a tunnel construction site), after another 1.5 km, the VR2 expressway ends at a roundabout. There is as exit to Estreito de Câmara de Lobos. 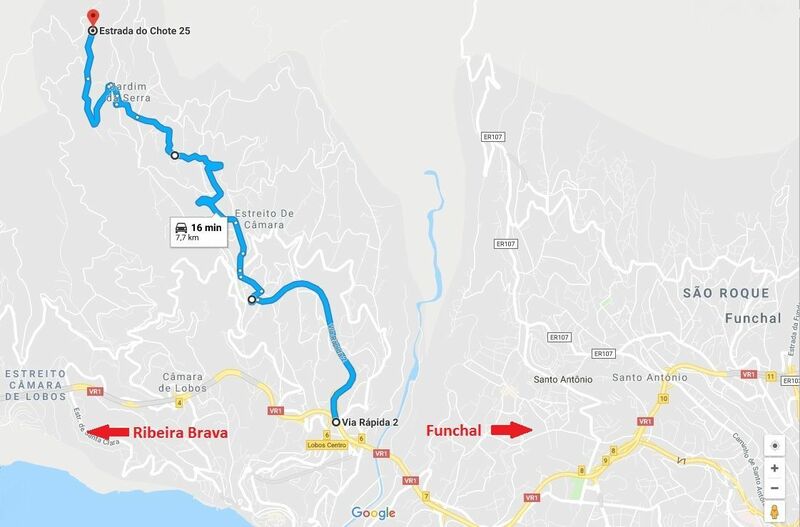 Follow the road immediately to the right after the roundabout for 400 m, through steep curves (on the right, pass the Continente supermarket), turn right when you find the church on the left, follow the road that goes up, after 600 m you find the "Bar Fiddy Poncha ". Continue forward. After 800 m you will find the "Quinta da Serra 3,7 km" sign and turn left at this junction. Continue on the road for 1.5 km and across the center of Jardim da Serra, after 600 m turn right, follow the signs "Quinta da Serra". Keep left at the following exits and follow the signs. The hotel is about 2 km after Jardim da Serra, on the right side of the road, for those who climb.